Somehwere between Kalyn's fragrant curried chicken, pilaf, and asparagus, and Erin's vanilla spiked marscapone with berries, I made an epiphany that I've made made many times. I am a food nerd. I should tell you all that as cliche as it sounds, most of my memories revolve around food. Scents, flavors, textures, full meals. Anyone who has had a prolonged conversation with me knows that I have to interject at some point with some food observation or useless bit of food trivia (Thank you, Larousse Gastronomique), if the topic isn't outright about food anyway. I totally believe that if my physics classes involved food, I would've aced every painful course in my lifetime and perhaps maybe even made it into medical school. Meh, maybe not. But I take trips just to eat. And when I share anecdotes about those trips I know that my friends, as much as they claim to love me, roll their eyes. As if me saying "This one time at The Slanted Door, I had this incredible Dungeness crab with cellophane noodle dish..." is tantamount to Michelle Flaherty blabbing for the thousandth time "This one time at band camp..."
Recently, I've been getting a pretty bad hankering for Dungeness crab. Scratch that. I don't know why I said "recently." I ALWAYS crave Dungeness. Whole specimens cut into quarters and flash sauteed with black bean sauce, garlic, and ginger. Marinated the way my mom does it, with green onions, garlic, chile flakes, soy sauce, and sesame oil, and eaten like a ceviche. My latest Dungeness memory evolved from my last trip to the Bay Area. I was with a couple of friends in search of lunch. We were playing hooky and tired of shopping at H&M and playing each other on the Urban Outfitters' Tetris machine while Jared looked for jeans. So we walked down to the Ferry Building and got a table at The Slanted Door. The rest, as it's said, is Vanessa food-history. My inner nerd remembers a mess of noodles. They were scattered like a pile of hay that just fought the wind. And in the soft tangled mess were morsels of dungeness crab. I could hear a few cellophane strands still sizzling from the stove. It seemed oddly kinetic coming from a such a bland looking dish. In all honesty, when the server brought it to the table, we thought perhaps we'd ordered the wrong thing. How could that taste good? The memory's source, lower left-hand corner. This dish was that good. Okay, almost. The square platter before me was so elegant and mild. It didn't need to be brash and attention grabbing. Crab meat, sweet and briny from the ocean, paired with the sweet heat of ginger. Not a trace of acidity. Just a bare suggestion of garlic, some allium-freshness from green onion, and a hefty dose of good wok hey. Ginger in fact is one of my favorite things. It looks like a wise old root with its knobby sections and neutral color. But, peel away the papery skin and agitate its flesh and you've unleashed a spicy nature that belies its meek appearance. It is unabashedly bold. Ready to take center stage in a cake or custard or ready to play up the supportive role with garlic and a myriad of spices that when mixed together sparks the mind to think of "mystery" and everything exotic—experienced and imagined. I love it for that. And I love this dish, even if I don't have the recipe. Or a precise memory. The flavors here allude to a happy occasion when I was sitting at a table with friends, playing hooky, and enjoying some badly needed sunshine. This was a moment my inner food nerd absolutely shined. I make no claim that this recipe is anything like what I had at The Slanted Door. But for someone who's been having food flashbacks and, at times, severe cases of withdrawal, it's pretty damn close. And pretty damn good. Break up the cake of dried noodles into rough thirds and place into a large bowl. Bring 6 cups of water to a boil and pour over broken noodles. Stir a bit and let sit until almost cooked through, about 10 minutes. When done, drain well. Set aside. Meanwhile, heat a sautepan or wok (lucky you) over high heat. When super hot, add the oil and turn the pan to coat the surface. Working quickly, add crushed garlic, ginger, and chile pepper, if using. Give it a quick stir—you should smell alot going on in the pan by now. Add the crab meat, fish or soy sauce, and the chopped green onions. Stir well for about a minute to mix evenly. Add the drained broken noodles to the pan and toss well. Serve in individual bowls, one big serving platter, it doesn't matter. Just be sure it's piping hot and still sizzling from the pan. Garnish with the chopped green bits of the leftover green onions. Serves 2. Now, quickly feed that inner nerd of yours. Woman, you can really write. I wish I could write like that. Very fun having dinner together. The cellophane noodle dish sounds great. Now I'm horribly depressed. Dungeness crab was my number one absolute favorite food...until I turned 21 and suddenly became allergic. Sigh. OMG, I think you just wrote the beginning of a chapter in my forthcoming memoir. ;-) I too am a food nerd and have entirely too many memories involved with food. I adore crab so I will have to try this recipe soon. I give thanks that ginger and garlic pair so mysteriously, so perfectly. I also give thanks for your recipe approximation! This food nerd, who lives 20 miles north of San Francisco, has never been to the Slanted Door. That looks SO good! I wish I could have this, just right now, for dinner! SO airy and fresh, all things I love! That's some heavy, heady stuff! I can't say that I've ever tasted a Dungeness crab, but when I do, it's going to have some serious benchmarks to attain. That looks really good. 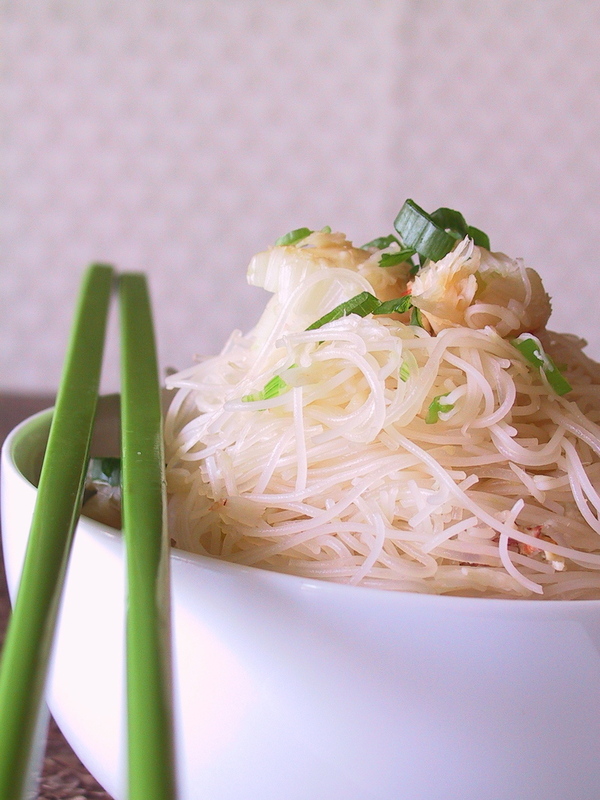 I'll take a rice vermicelli salad any day. Always so fresh and light, it's happiness. I love the ginger pic, what a lovely light! And I like your writing so much, you have a real talent! First and foremost, I JUST LOVE THAT CHOPSTICKS! How i would love to have one in that colour - green... need i say more? I love noodles and crab... will definitely have a go. Thanks for the recipe. Yep, you were a born writer, I think. You almost don't need pics, but then your pics are so lovely - you really do take your readers though the experience. I look forward to getting together again, I had a great time with you two. Tired of shopping at H&M??!! Blasphemy! But I do love Dungeness crab & like you I always crave it. I also love The Slanted Door & I am confident that your interpretation was delicious. I love your comparison of a food nerd to a band geek. Most of my sentences start "One time I had/ate..." and my husband always follows with "this one time at band camp". Now that you've made The Slanted Door sound so magically delicious I have to go there! You are not a food nerd ... you are a brilliant food blogger who appreciates good food. Beautiful dish and the picture is gorgeous! Sara—lol, to my fellow food nerd :) let me know how you like it. cookiecrumb—i can't get enough of ginger. as i write this comment, i'm sipping on a hot ginger infusion...i've been feeling a cold coming on, yikes. Bea—it was wonderfully light, but so savory. it was just what we needed. s'kat—it's my favorite crab. one of the first things i remember seeing my parents eat were dungeness crabs (in the ceviche-like recipe mentioned above). the sound they'd make sucking the meat out of the spindly legs and cracking open the body and having this flaky meat appear was amazing. mumu—i definitely felt like having noodles that day. but it's never too heavy. mae—aren't these fun? my friend Romina owns this fun pair. she has orange ones, too! dwight—cry not, Archi-hell-tect. there will be more many meals to come. Kady—ah so, you feel my pain! but we know we're cool...on the inside, ha! hey that makes us all food nerds! ahh...i love ginger, i love crab, i love san francisco, and i love the ferry bldg. and i also love your post about all these things. by the way - i am trying to build up a global map of food bloggers. add yourself when you get a chance! I love the photo up top. And the story as well. But "inner nerd"? This sounds more like inner food goddess to me! Ooooh, were we sharing food nerd psychic waves? I made a glass noodle salad this week too. Yours looks quite delicious and I really enjoyed reading your post! shaz—isn't that why we love the blogosphere? nerds unite! genevieve—I'll definitely add myself to the map! Hello, we are now 4 years later. and me visting yet another year later... my but that recipe sounds good! The noodles you share look so delicious. Hook me up!